Create a stunning nautical theme to your decks and handrails with stainless steel wire balustrades. Stainless steel wire is very strong and extremely durable and is suitable for use around salt exposed locations. 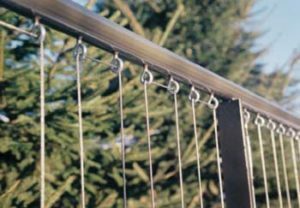 Stainless steel wire balustrades are constructed using 3mm diameter stainless steel wire combined with stainless steel turnbuckles, eyebolts and fittings. The fittings are joined using a mechanical or hydraulic crimping tool capable of enormous strength. Turnbuckles allow for adjustment of the wires after installation ensuring your new balustrades remains straight and strong for the term of its life. Used extensively for yacht and motor boat railings and fittings, stainless steel will not rust or corrode. Stainless steel wire can be threaded through timber or stainless steel posts and can be made to almost any length. 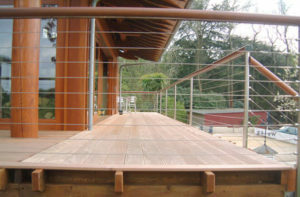 Wire balustrades are often teamed with timber decks, pergolas and handrails. Stainless steel wire and turnbuckle handrail designs can be used for fencing, gates, screens, pergola’s, decks and many other uses. 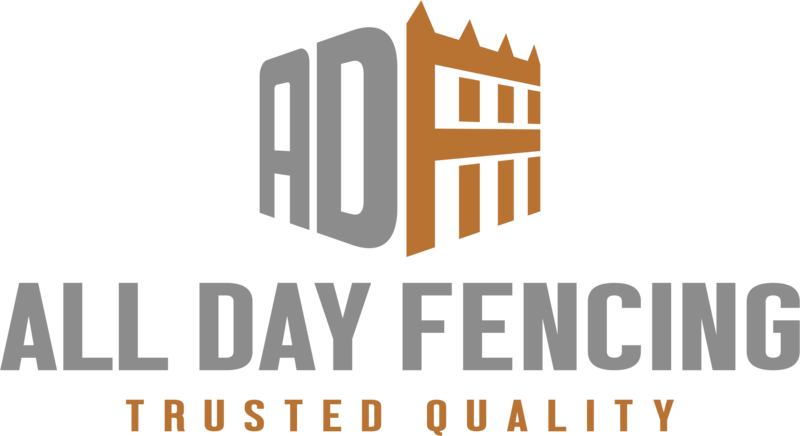 A cost effective way to enhance or extend your existing fence. Stainless steel wire is perfect for supporting vines and can be easily be fixed to fences and walls. Flexable in design, wire can be installed in many shapes including curves and arches. Create a feature garden on your wall using stainless steel wire supports. Stainless steel wires should be spaced at no more than 110mm apart. Wires can be constructed in a vertical or horizontal pattern. 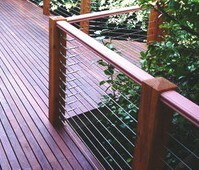 Horizontal wires are not recommended for verandah rails or handrails more than 1 metre above ground level. 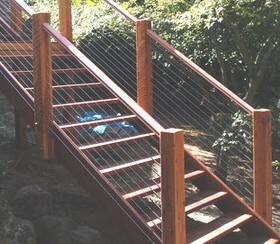 Quick and easy to install stainless wire handrails are low maintenance and very durable. With a minimal look, stainless wire balustrades provide safety without compromising the view. For those wishing to ‘go it alone’ or for more design ideas, download our guide to Construction Guides from our online store.